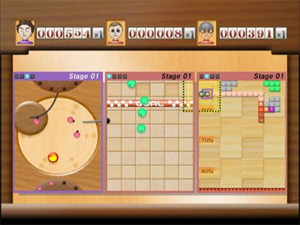 A puzzle game developed by Mindware Corp. and released on the WiiWare download service. The Ma, Bo and Shi of the game's title refer to the circle, bar and square games that are shown side-by-side. The player can either take part in each game separately, or three players can compete in each of the different games. The	aim of the game is to score one million points across the three games. The player controls a spinning circle that must be moved around to collide enemies before they leave the game area. The player controls a rotating stick that has to be maneuvered through a level. The center of the stick is weak and if it collides with an obstacle or enemy then the game ends. The player controls a block with a tail of fire behind it, destroying obstacles with the tail before they touch the bottom of the screen.